If the timing is right, you’ll even see humpback whales during their visit from Alaska! Are you looking for the best sunset views Maui has to offer? Consider the Calypso dinner cruise. 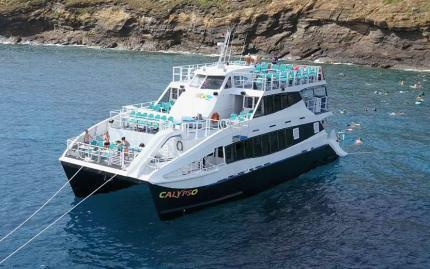 This stable, comfortable, triple-deck catamaran leaves from centrally-located Ma’alaea Harbor. The relaxing two-and-a-half-hour excursion gives you time to enjoy a delicious meal, explore the incredible craft, listen to great live music, and watch the sun go down from your place on top of the waves! Seating on the Calypso dinner cruise comfortably accommodates any size group, including couples, families, and even large corporate events.After you’ve settled in, follow your nose to the delicious appetizers, and pick up a fizzy soda or tropical juice. Your Calypso dinner cruise includes two free drinks, and once the catamaran has motored out of the harbor, you can order alcohol. A local live musician plays new and old favorites throughout the Calypso dinner cruise. When it’s time for the delicious main meal, our onboard chef Keoni carves the juicy prime rib. Mahi mahi, teriyaki chicken, steamed vegetables, roasted potatoes, and chocolate cake is also ready for you to eat. There is plenty of time to gaze at the islands of Kaho’olawe and Lanai in the distance. Closer to the boat, you’ll see the Kahalawai Mountains of west Maui as they stretch toward the sky. When humpback whales are visiting the Islands from Alaska, chances are excellent that you will see some of the magnificent marine mammals on your Calypso dinner cruise! You and your group will love this fun time on the sea, so follow the sun, love your loved ones, and have a great meal on the Calypso dinner cruise. Aloha! Note: 2 adult beverages are complimentary and a third is available for $3 aboard.